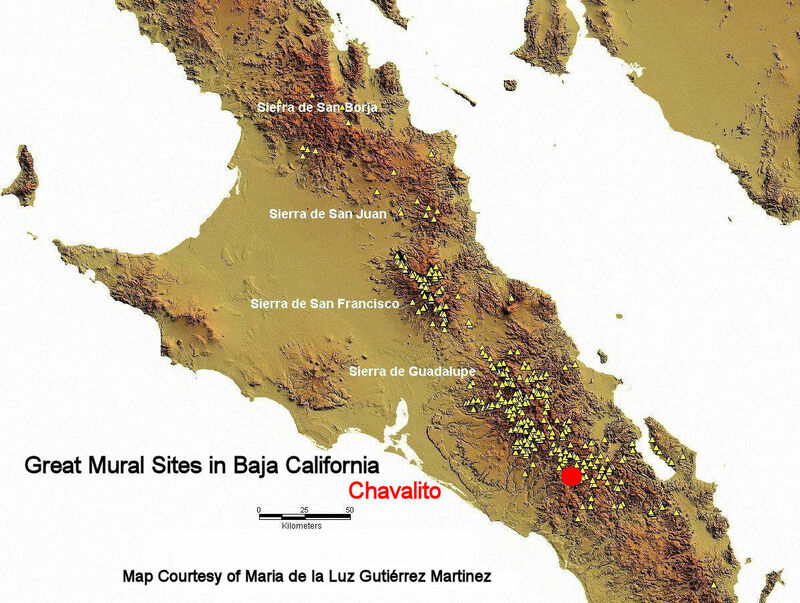 El Chavalito is a large Great Mural site in the Sierra de Guadalupe, Baja California Sur (map). 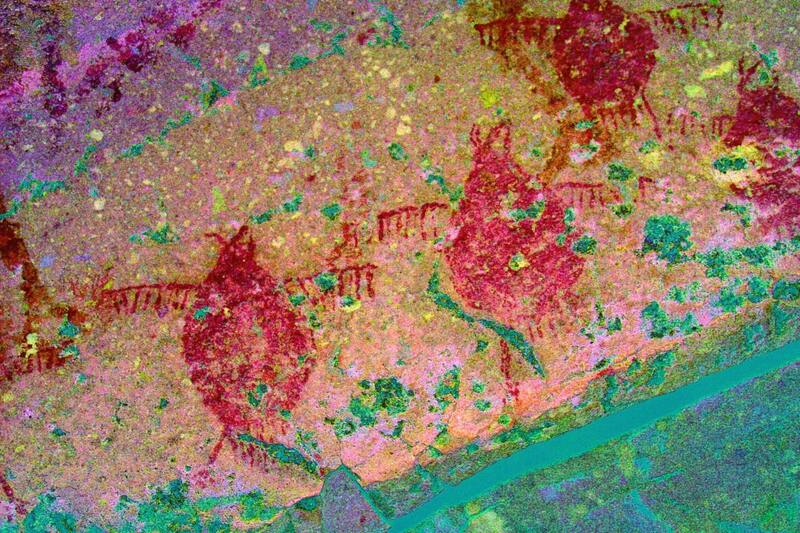 The rock art here is fascinating and can be very beautiful. 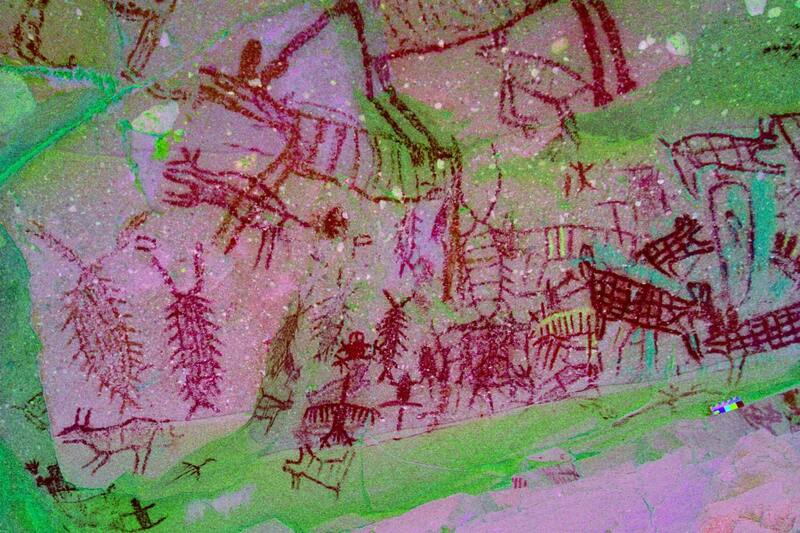 It is a significant site for the study of Great Mural art. In some ways it is a companion site to Los Clavelitos. They are 27 km apart. 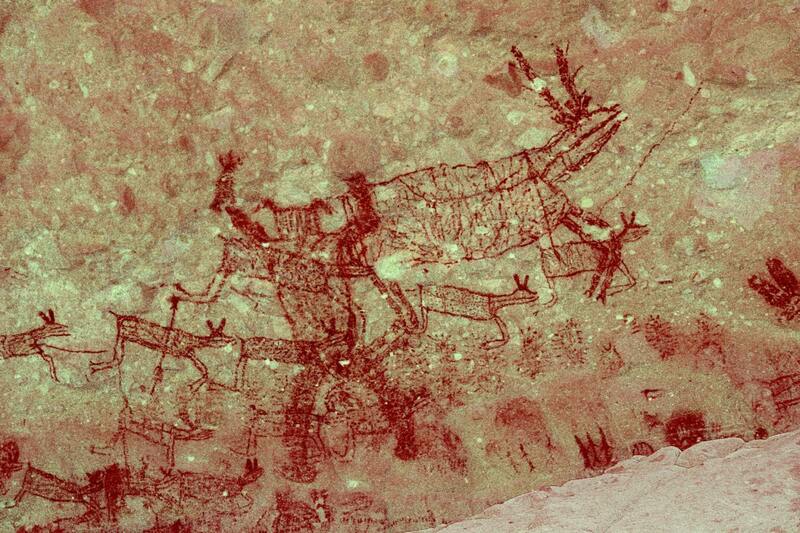 They are both large sites with hundreds of images in many different Great Mural sub-styles. They are both dominated by a single huge mono. In many other ways the sites differ, especially in the sub-styles that are present. To my mind Chavalito gets the prize for the incredible creativity and variety of its art. 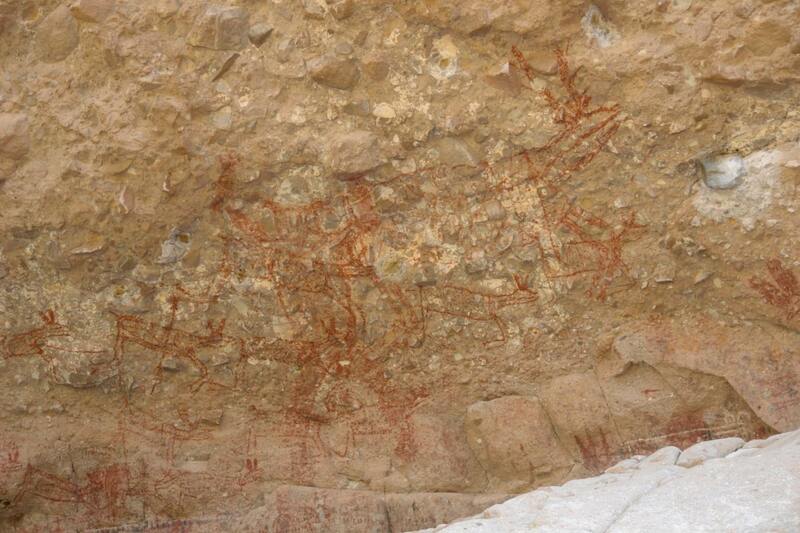 It lacks the classic beauty of the art in Sierra de San Francisco (see my slideshow here on sites near Cueva Pintada), but makes up for that with vitality and inventiveness. To see a higher resolution image from inside the slideshow open the image in a new window (icon at far upper right). Click on a thumbnail below to see a panorama of the site. Click on a red dot in the image below to open a slide show of images in that area. Photography Copyright 2006, 2007 by Jon Harman. 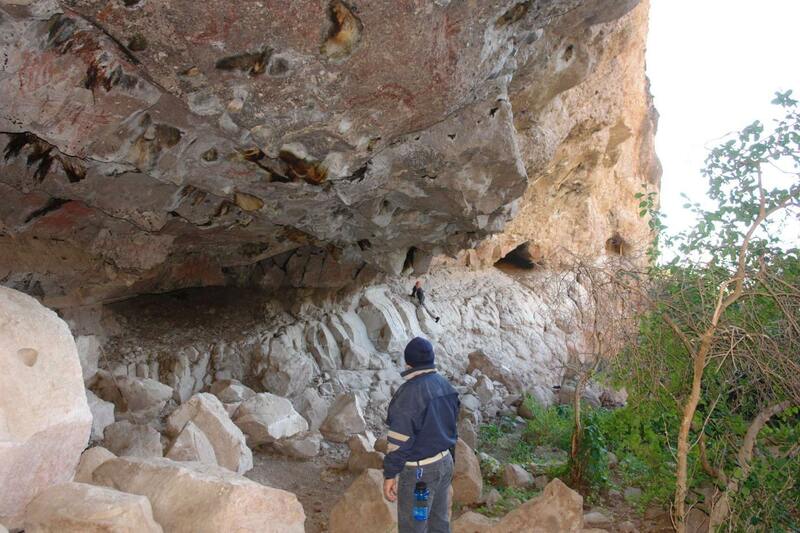 I visited this site on December 23, 2006 as part of the INAH project: Identidad Social, Comunicación Ritual y Arte Rupestre: El Gran Mural de la Sierra de Guadalupe B.C.S. under the leadership of Maria de la Luz Gutiérrez Martinez. We were accompanied by INAH Custodian Miguel Angel Aguilar and local guide Victor Manuel Mayoral Asuna. My tript in the Sierra de Guadalupe were an incredible experience. My sincere thanks to Maria de la Luz Gutiérrez Martinez for making this possible.